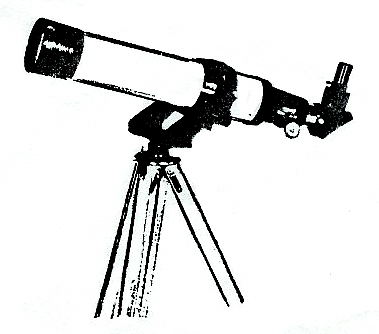 The Perfect Telescope is. . .
. . . a small apochromatic refractor. introduced in 1988 but it has since replaced by even more advanced models. When I was a young man, I built the largest telescope in my hometown. It was a whopping 8 inches in diameter and none of my friends had ever seen anything like it. By the time I was in my forties, I'd built several telescopes (mostly for the kids and their friends), ranging in size from 4 to 12-1/2 inches in diameter. In those days, a 12 1/2 inch telescope was considered a monster and being recognized for having built one that big was quite an honor. I will be 73 in June, and when I look back to the days when I was an avid telescope maker (or assembler) I can't recall spending nearly as much time observing the heavens as I spent in hauling the things around to show people and tell them how I made them from plate glass, plywood, and old plumbing parts. After having been away from telescope making for many years, I found that I had lost the fascination for hours of grinding and testing. I just wanted something to look through and have some fun with when the clouds and temperature would permit. Looking around the property, I discovered that I had one complete 10-inch telescope and a tube, mirrors and focuser for a 12 1/2- incher -- all of the smaller units had gone to other homes. Some of your more mature readers might guess what I discovered. The damn things were too heavy-much heavier than I remembered. They were good performers in their day. But, it was plain that it was going to take a lot of time, money, and muscle to restore either one. I had none of those things to spare . About that time, I started paying more attention to advertisements for "apochromatic refractors" in the astronomy magazines. I had been hearing about them for several years, but I didn't know the difference between an apochromat and a laundromat. I just figured it was another one of those gimmicks to part a sucker from his hard earned money. Anyway, to make a long story short, a friend showed me an ad for a used Tele Vue Genesis, and we took a drive that evening to have a look at it. When we arrived, I learned that there was no stand to go with it. Nevertheless, on my friend's excited recommendation, I bought the thing and took it home. After one leisurely evening in my workshop, I had a 4-inch refractor on a homemade base sitting atop an old surveyor's tripod, and was ready for the next clear night. When the first clear night came, I was amazed! I had no idea that a telescope which was so small on the outside could be so big on the inside. I can't recall ever seeing anything as clearly with the 10-inch telescope I had been using 20 plus years ago. I suppose that could be due to the fact that I was living in New Jersey at the time and that I hadn't done any serious observing in years. The result of all this is that I am very happy with this little telescope in so many ways. It is much more compact than the refractors that were around when I was a boy. It has a very wide, clean, field of view. I can easily use it with my glasses on. And, I can set it up and take it down almost instantly. I have saved the best reason for owning such a telescope for last. I do not recall my wife (of 44 years) ever having more than a peek through any of my telescopes. She said they were always a pain to use. Now that I have this little hot-dog refractor, she is with me just about every time I set it up and it has been the launching pad for many a fine, and sometimes overdue, conversation. Mr. Cook, after reading over this letter, I really don't think it is the kind of technical stuff you people are looking for. But I promised to tell you about the telescope that's been best for me and I hope my comments will be of some use to you.